Farmersgirl Kitchen: Forgotten Fatherland - a book for Father's Day? "In 1886 Elisabeth Nietzsche, Friedrich's bigoted, imperious sister, founded a racially pure colony in Paraguay together with a band of blond haired fellow Germans. 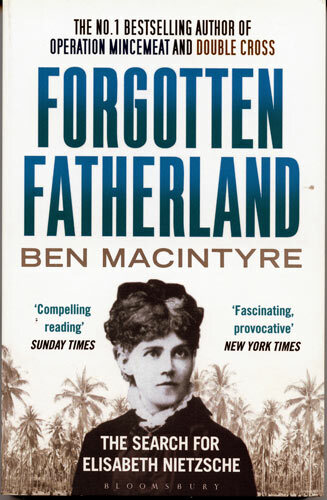 Over a century later, Ben MacIntyre sought out the survivors of Nueva Germania to discover the remains of their bizarre colony. Forgotten Fatherland vividly recounts his arduous adventure locating the survivors, while also tracing the colourful history of Elisabeth's return to Europe where she became a mentor to Hitler. Brilliantly researched and mordantly funny, this is an illuminating portrait of a forgotten people and a woman whose deep influence on the twentieth century can only now be fully understood"
I thought this would be a fascinating book and was expecting to read the story of a strong, if rather misguided woman, interspersed with an account of Ben Macintyre's journey to find Nueva Germania. Those two elements do feature in the book but I found the narrative confusing with too many different stories running alongside each other. Not only do we hear about Elisabeth but also about the bizarre antics of Paraguayan Dictator Fransisco Solano Lopez and his Irish wife Eliza Lynch. Other historical characters are introduced and the story jumps between them without really concluding any of the stories. I read as far as page 63 in this 248 page paperback but found the style of writing difficult and frustrating to follow so have not finished the book. I don't usually find it difficult to follow a complex plot and am generally very good at keeping track of a wide cast of characters, so I couldn't really explain why this particular book defeated me. My friend summed it up when she was describing a TV drama that she had abadoned, she said: "I didn't really care what happened to any of the characters" and that's exactly what I felt about the characters in this book, including the author! There are very positive reviews from the Guardian, Sunday Times and Independent, so someone must have seen something in it that I didn't. If you have read Ben MacIntyre's other books "Operation Mincemeat" and "Double Cross" you may well enjoy this book too, but I'm afraid it just didn't do it for me.